My favorite way to eat kale. 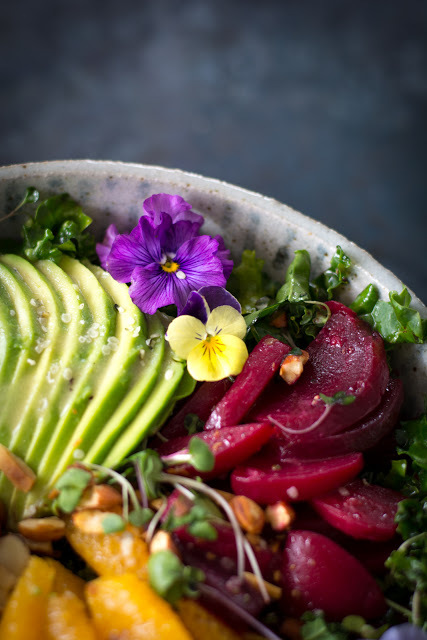 A huge kale bowl, marinated beets, fruit, and pansies…because they are growing in my garden and call spring. I love creating food with seasonal foods and with what I can find growing in my garden and around my yard. 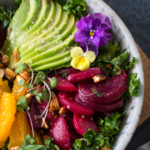 A kale bowl, marinated beets, fruit, and pansies have become my favorite salad bowl. It’s loaded with flavors and nutrition. I walked around my yard looking for a new star. Pansies! Pansies are edible just ask the deer that eat every pansy that I plant. I love eating clean whole foods. I feel so much better when I do. I decided to make a Kale Bowl instead of a Buddha bowl. 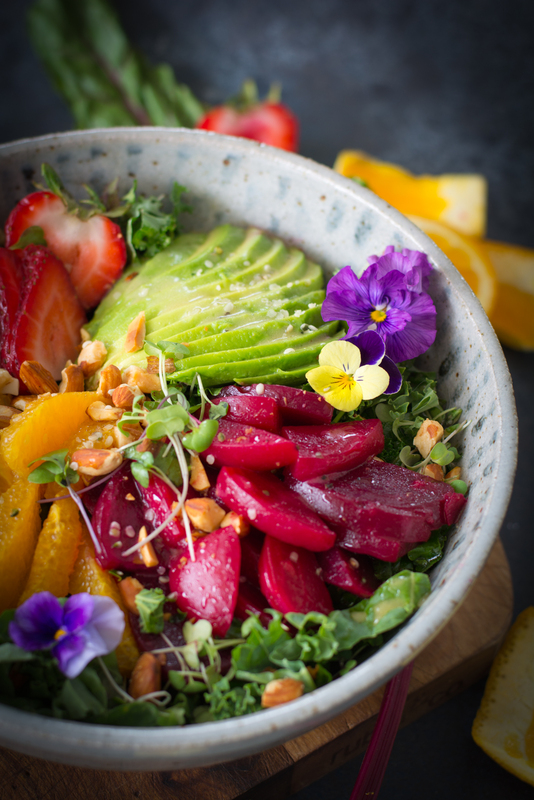 No grains, no protein, just plant based with a few pansies for a garnish. 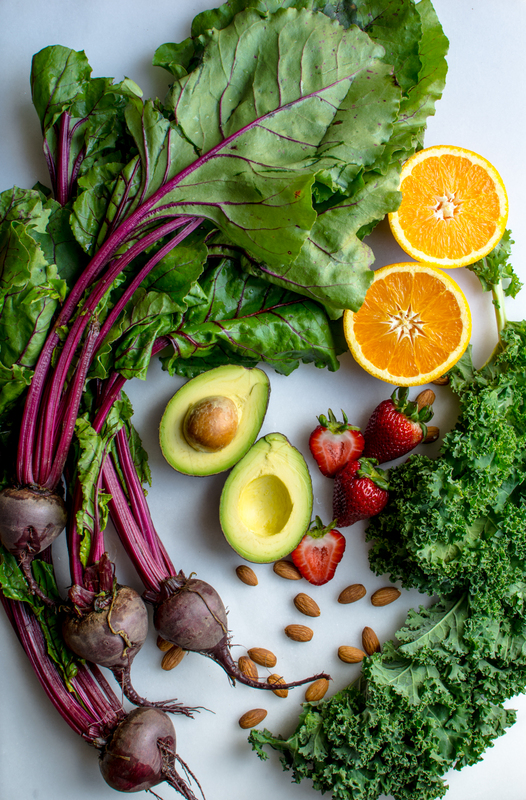 This kale bowl is topped with roasted marinated beets, oranges, strawberries, avocado and a few toasted almonds. I like to start with washing and prepping the kale. Thoroughly wash kale and pat dry. Remove the tough stem and roughly chop. 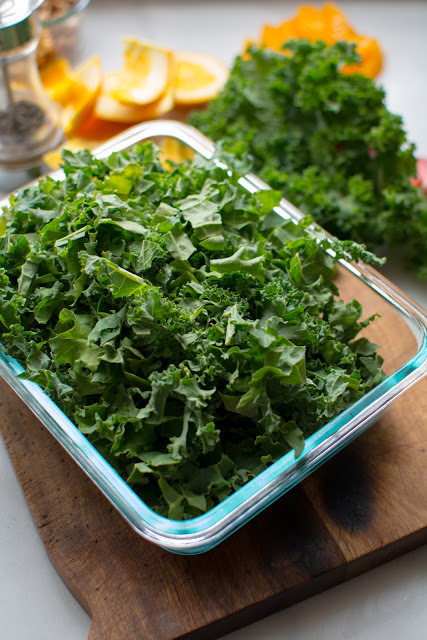 Place the dry kale in a container with a lid. Refrigerate. The kale will last for 3-5 days or longer if nice and fresh. This is great to have on hand and saves prep time for meals. Was the beets and remove the long tops. Don’t throw them away. I like to juice them, but they can be sauteed as well. Preheat oven to 350F. 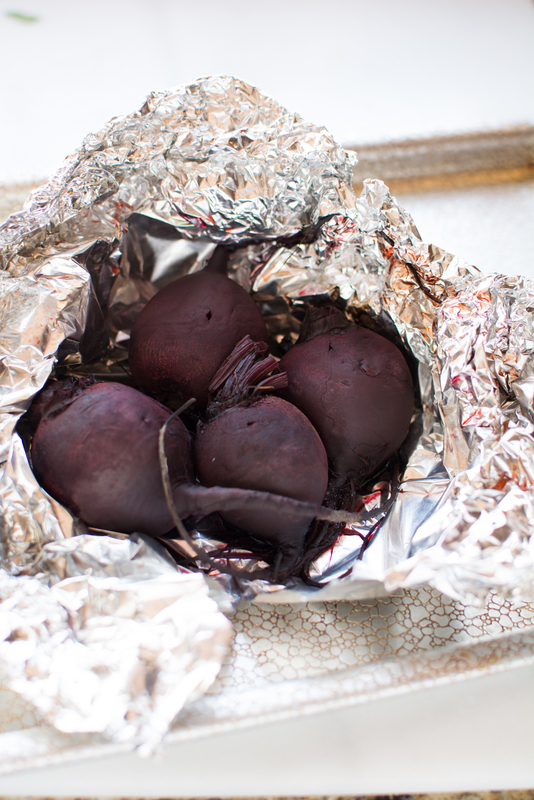 Place beets on a large sheet of heavy aluminum foil. Crimp the edges nice and tight. Place on a baking sheet and cook in preheated oven for at least an hour or until a skewer can be easily inserted. Remove the skin by gently rubbing with a cloth or paper towel. 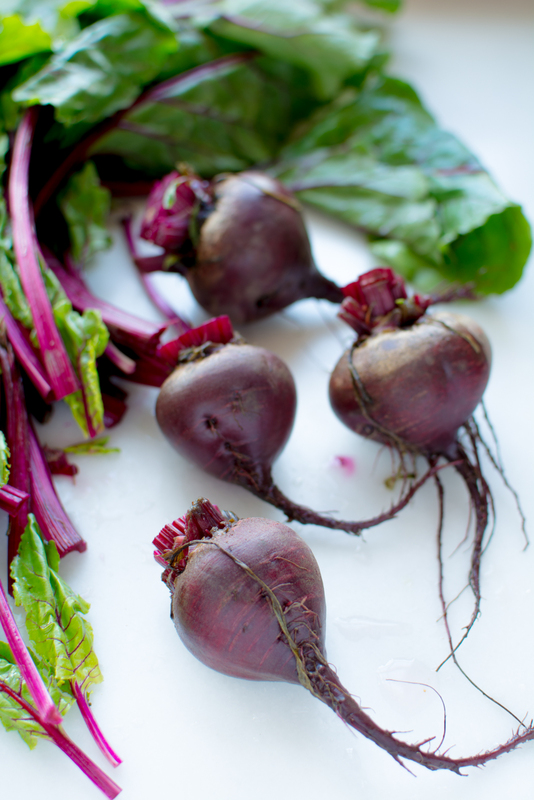 Slice, dice or quarter the beets. Whatever suits your fancy. Mix juice from an orange, 2 tablespoons vinegar, and zest from 1/2 an orange to make the marinade. 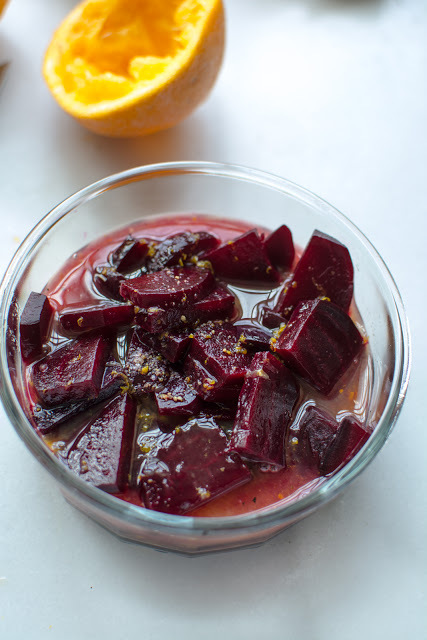 Pour over chopped beets. Refrigerate for at least an hour. They will last refrigerated for 3-5 days and the flavors improve over time. Another advance prep step. 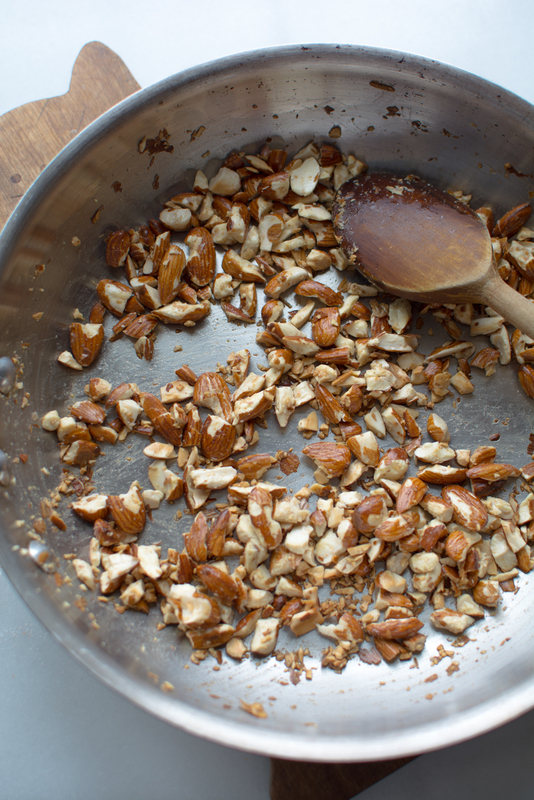 If you would like to roast the almonds, roughly chop. 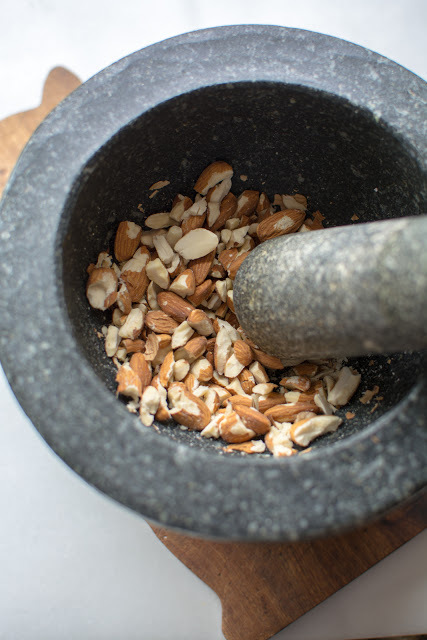 I like to throw nuts into my huge mortar and give them a good bash just to break them up a bit. Toss into a skillet with about 1 teaspoon oil or butter or they can be dry roasted. Your choice. I’m opting for butter because buttered and salted almonds on a salad are the bomb. Cook over low heat until lightly brown. Remove from heat. 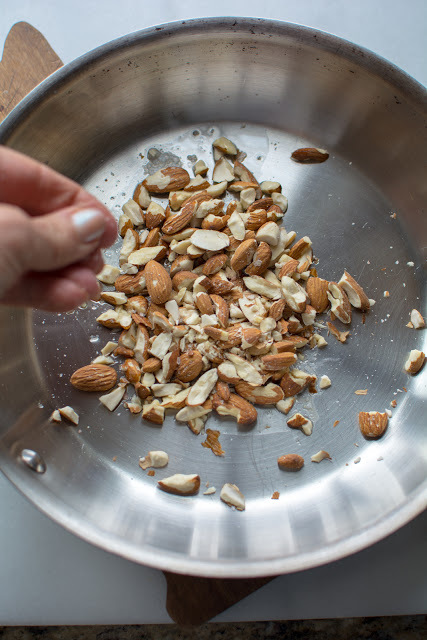 Nut’s can be toasted in advance as well and stored at room temp. I don’t know how long they will last because I have never kept them around for longer than a day because we eat whatever is leftover. In a small pint jar add all the ingredients for the dressing. Give it a good shake for a minute or so. 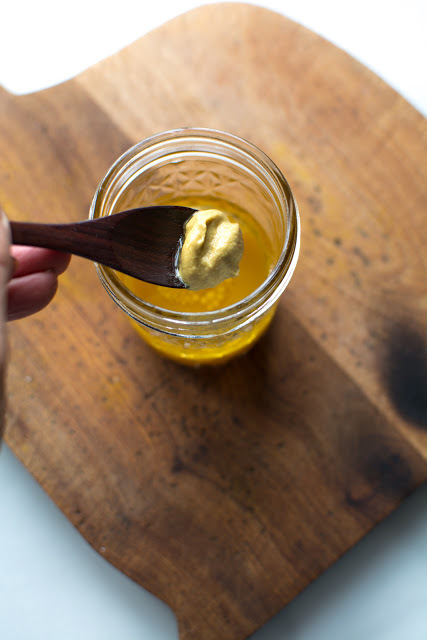 Dressing can be made in advance as well. 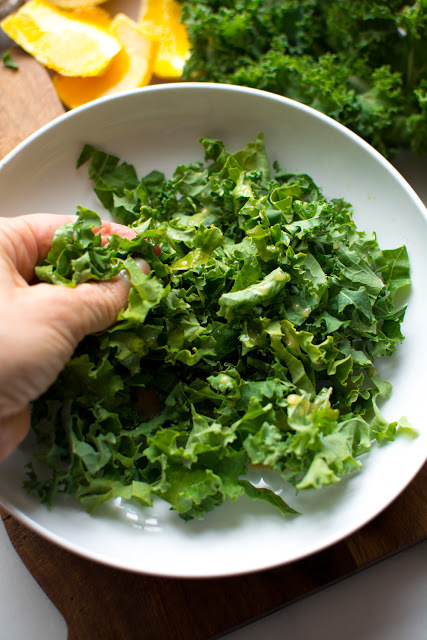 To assemble: Place desired amount of kale in a serving bowl. I like about 1 1/2 cups per serving for a main course salad. Massage 2 tablespoons of the dressing into the kale. Arrange the marinated beets, sliced avocado, orange wedges, sliced strawberries on top of the kale. Sprinkle with toasted almonds. You can sprinkle with hemp hearts, chia seeds, sesame seeds, micro greens, etc. 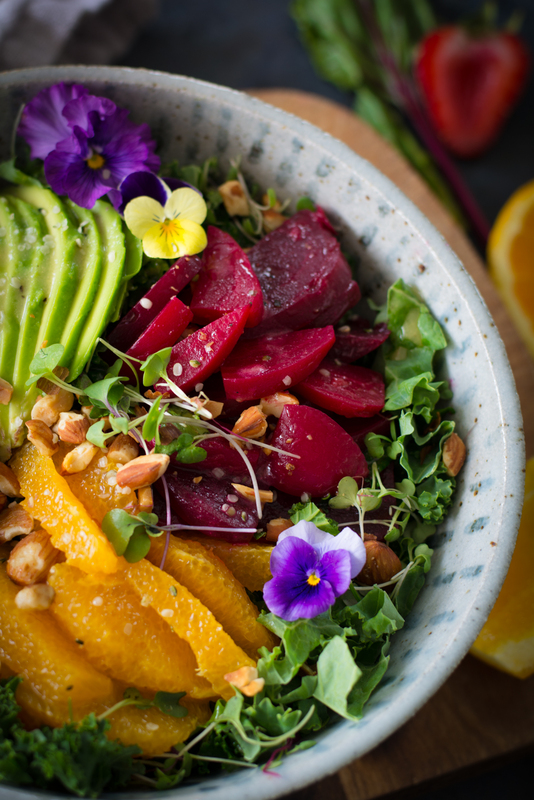 Customize your Kale bowl. I think grilled Salmon and cooked quinoa would be delicious. 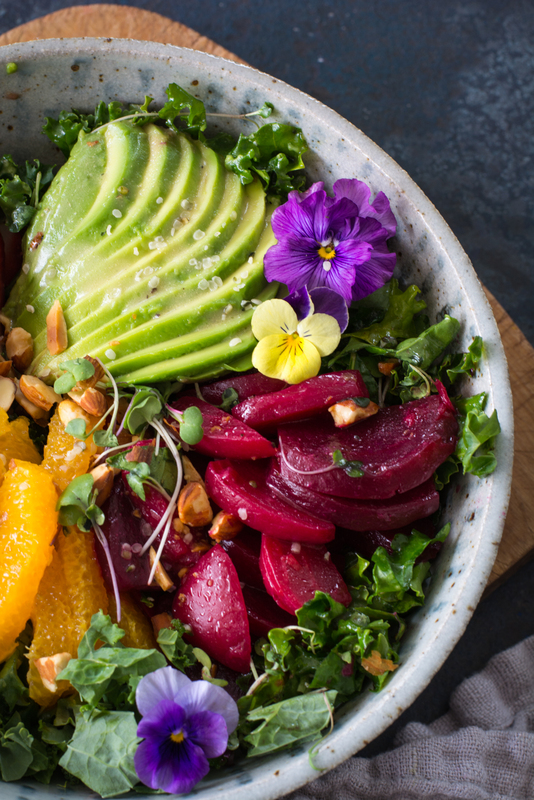 A kale bowl, marinated beets, fruit, and pansies have become my favorite salad bowl. It’s loaded with flavors and nutrition. I like to start with washing and prepping the kale. Thoroughly wash kale and pat dry. Remove the tough stem and roughly chop. 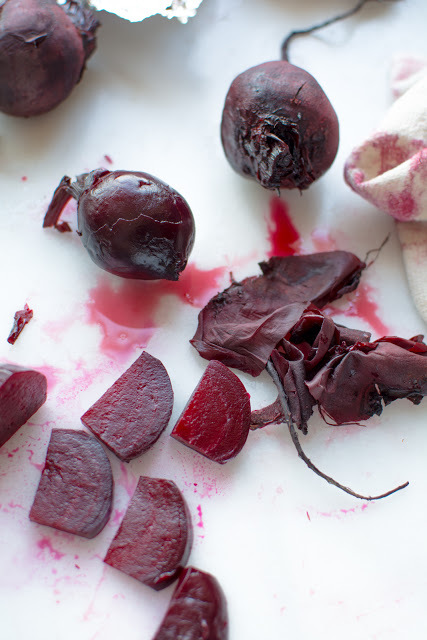 Remove and wash beets. 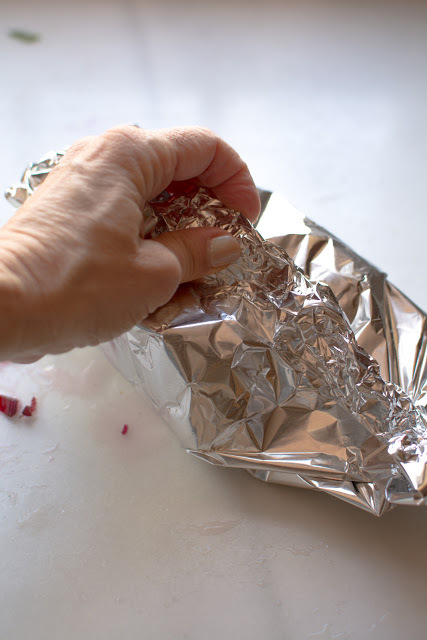 Wrap in foil and crimp edges tightly. Set on a baking sheet and place in a preheated 350F oven. Bake for 1 hour or until no longer hard. I like to use a wooden skewer to poke the beets with. The skewer should slide in easily. Segment on of the oranges. 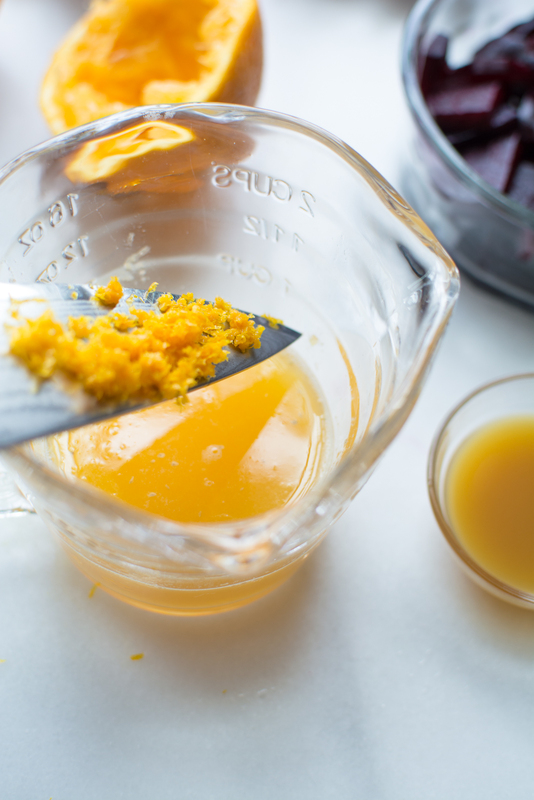 Reserve juice and orange zest. Set aside. 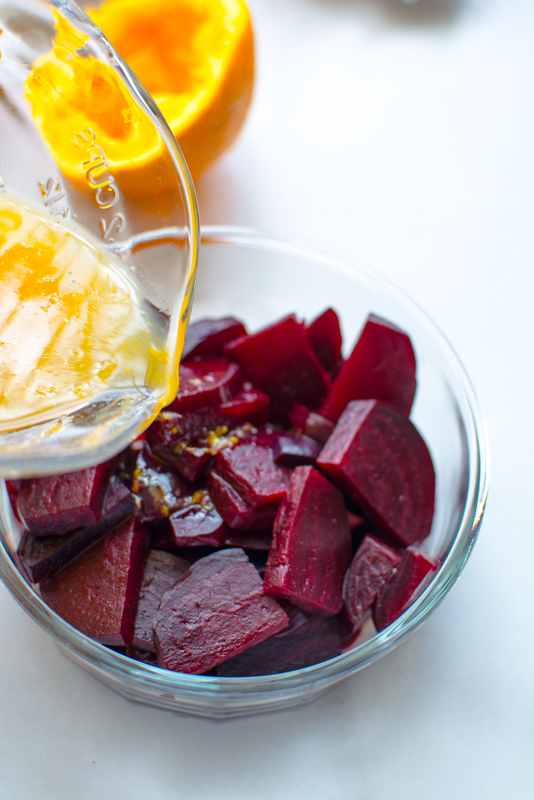 For the Marinated Beets: Mix juice from one orange, vinegar and orange zest together. Pour over cooled, cooked beets. 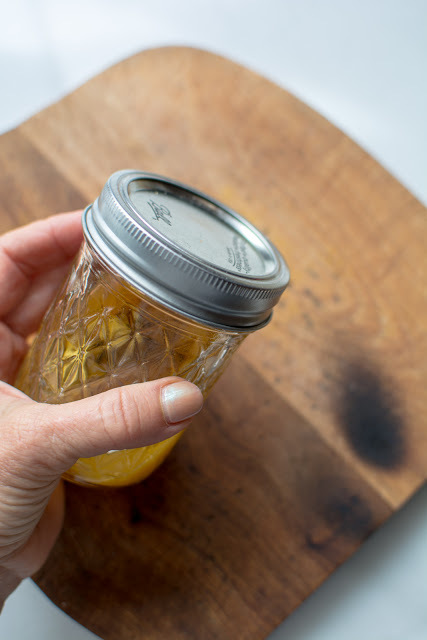 Refrigerate for at least an hour or up to 3 days. 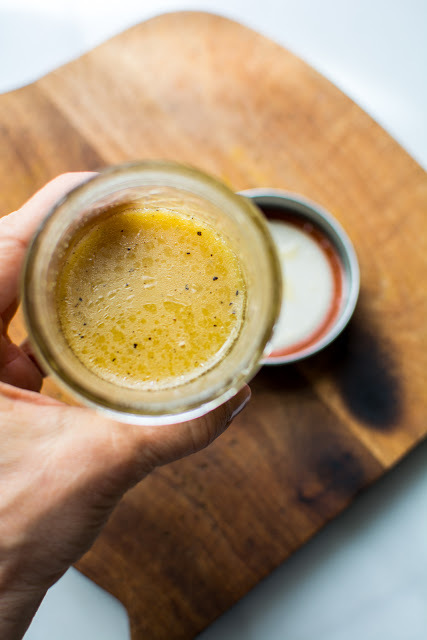 For the Salad Dressing: In a pint jar combine, the vinegar, avocado oil, dijon, salt and pepper. Shake vigorously until well blended. Refrigerate until ready to use. 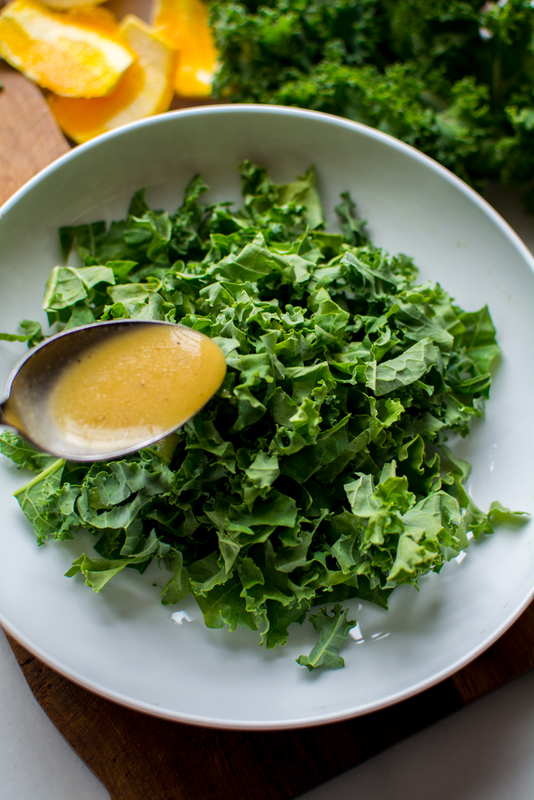 To assemble the Kale Bowl: Toss about 1 1/2 cups of chopped kale with 2 tablespoons of the dressing. Massage kale until it begins to soften. Place in a bowl. Arrange marinated beets, orange segments, strawberries, avocado, slices and almonds. Serve immediately. Makes approx 3-4 servings. 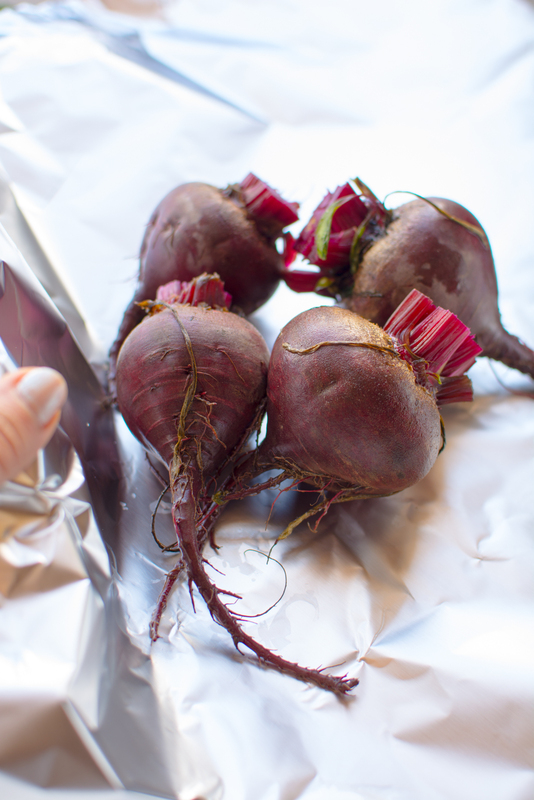 60 minute cooking time is for the beets. 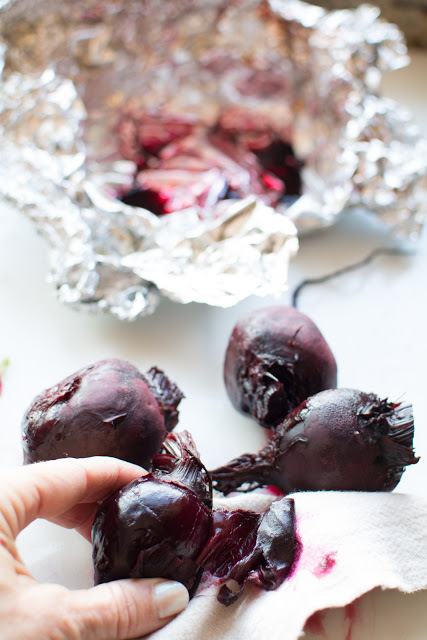 Beets can be cooked in a pressure cooker which would decrease the time significantly. Thank you so much. You have just made my day.